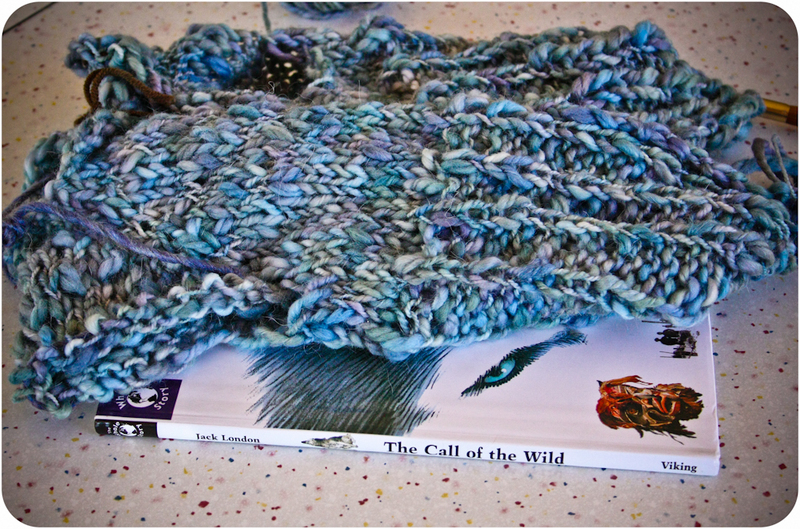 For this week's Yarn Along, I'm nearly finished with the Bitty Bump spring cardigan that I started late last week. I had my doubts about this bulky, thick and thin yarn, but it has knit up nicely in this pattern. As for my reading, I've just started reading The Call of the Wild aloud to the kids. We're about 3/4 of the way through the book, although I'm starting to wish I had split each chapter in half. The chapters are almost too long to read in one sitting. I have to say that I'm enjoying The Whole Story version of this book. It's unabridged, but includes special notes, photographs, sketches and maps of the area and time period to enhance appreciation and knowledge of what is happening in the story. However, I'm not sure I would have chosen to let Finn sit in on this book had I remembered how scary and violent it is. Fortunately, much of it seems to go over his head. I also started Finn's next pair of crazy socks. I'm nearly finished with the first one, but I managed to leave it at my grandmother's house when we went for a visit on Monday. 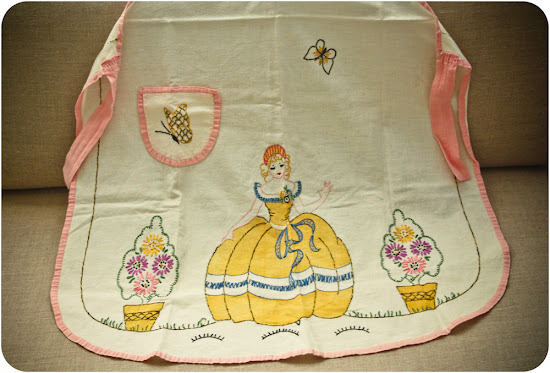 I guess it is ultimately a happy exchange though since I managed to come home with the beauty below: my great, great grandmother's hand-embroidered apron. I don't remember ever even seeing this apron before but the handwork is exquisite, perfectly even stitches with bright colors still intact. I now need a great idea of something to do to display this lovely piece of my family's history. 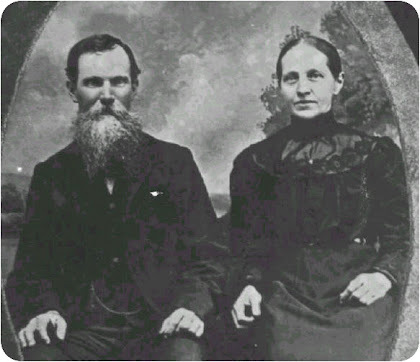 The picture below is of my great, great grandparents (my paternal grandmother's paternal grandmother). My great, great grandmother's name was Delia Broyhill (of Broyhill furniture fame, her nephew started the company), and she lived from 1862 to 1948, the last several years of which she lived with my grandmother's family. She was born, lived her entire life, and died in the same small NC mountain community that my grandmother grew up in. And that's about the extent I know about her. 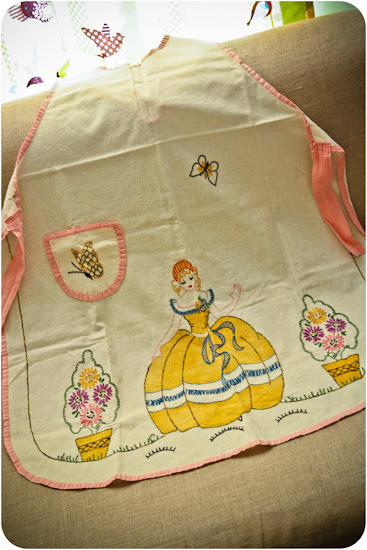 But now I have this lovely apron as a link between her generation, her handwork and mine. It makes me want to embroider an apron to match! What a fantastic heirloom. Definitely a treasure. Such a treasure the hand-embroidered apron is. It is beautiful and the photo is lovely to look at. Such a treasure indeed! A matching apron is a must! What a beautiful heirloom and you have a photo of the lady who made it, how wonderful. That's a very lovely apron. That apron is amazing! I can't believe how nice it looks considering the years. How special that you not only KNOW who your great great grandparents are but that you have their stories and that tangible collection. So important! And the sweater!! Yay!! So excited! What a treasure Joy and what a blessing that you know so much about your family's history.